Release Date: August 10th, 2007 by Paramount Pictures. The Cast: Claire Danes, Charlie Cox, Sienna Miller, Ricky Gervais, Jason Flemyng, Peter O'Toole, Michelle Pfeiffer, Robert De Niro. BASIC PREMISE: Tristan (Cox) must find a fallen star, Yvaine (Danes) to show his love for Victoria (Miller) while Lamia (Pfeiffer), an old wicked witch, needs Yvaine’s heart to become young again. Meanwhile, the three sons of a recently-deceased king (O’Toole) compete for the throne. 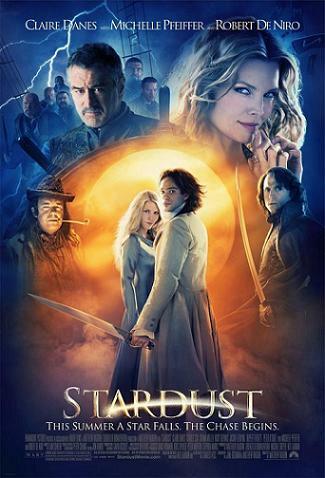 ENTERTAINMENT VALUE: Once you get over the contrived plot of Stardust, it’s easy to be exhilarated, as if you were watching a cross between The Princess Bride and Lord of the Rings. Tristan, the quite likable protagonist, lives in a small town protected by a wall. His only chance to get married to the love of life, Victoria, is to bring her a falling star, so he goes on an exciting, magical adventure to retrieve one named Yvaine and bring her back safely before the wicked witch, Lamia tries to capture her. The three sons of a recently-deceased king also need to find Yvaine so that one of them can become the new king, if they can get ahold of her precious necklace. Very rarely has such an epic tale been so fun to watch. Fortunately, each of the cast members adds at least a modicum of charisma to their role, even Michelle Pfeiffer as the smarmy witch. Robert De Niro, in a brief supporting role as a ship captain, has so much pizzazz that his character deserves to be the protagonist of another movie. Co-writer/director Matthew Vaughn does a masterful job of combining the genres of science fiction, romance, drama, adventure and comedy into an enchanting epic that deserves to be a classic or at least a sleeper hit. IN A NUTSHELL: A magical, enchanting and exhilarating epic adventure.